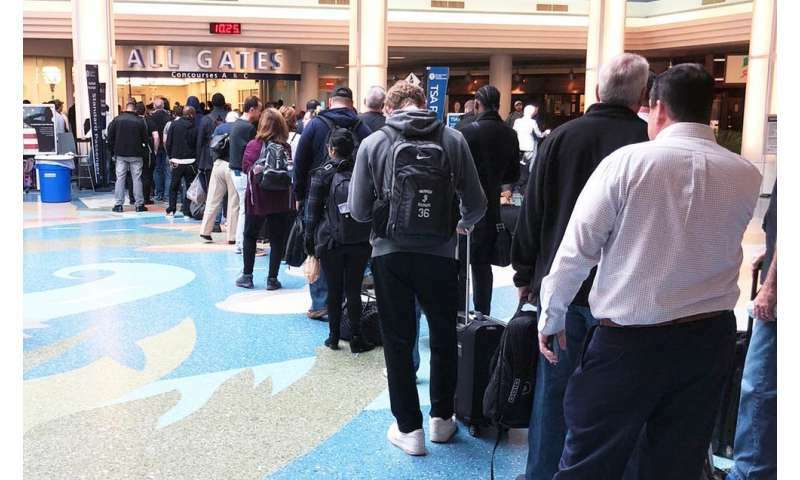 Warning: After reading this article, you will never again stand in a line without thinking about how to make your wait time shorter. And as an expert in operations management, I'm here to spread the word that sometimes a longer line may actually be a good thing. My family is used to my preaching. On a recent shopping excursion, we overheard an impatient customer blurt out, "Why is this line so long?" To which my daughter responded, with a glare in my direction, "Don't even consider telling him about queuing theory." Queuing theory is the mathematical science behind why the line is so long. A queue is just another word to describe a line of things waiting their turn – whether it's people waiting to get a free ice cream cone or a new car moving through the assembly line. Maybe a retail manager is spiteful and wants to see every customer get angry. But that's not a good business strategy and probably an unlikely reason for a long line. Another possibility is that the manager puts more value on her costs to provide a service – in this case, staffing adequately to ring up your purchase speedily – than on your time waiting for that service. This scenario is a more likely reason, but still not a good long-term business strategy. Even though it's easy to assume some version of this is at the root of your line-waiting woes, it's typically not the reason. Or perhaps you're waiting for a service that is highly sought after by many people. In this case, the line might indicate just how smart you are to be waiting in it for your share of whatever's at the other end. This sounds promising, but is rarely the case. It's not often you camp out for front-row tickets or to be the first to get some new gadget. The most likely scenario is that you're misunderstanding how the line is designed. Seeing a line snake back and forth across the width of a store three times can be deceiving as to how long you may actually have to wait. In what may appear to be a very long line, the service rate can be so good that the line moves very quickly. This concept of system design rests on a mathematical theorem called Little's Law. It's named after its creator, John Dutton Conant Little, an MIT professor who specializes in operations research. Little's Law provides the math that a researcher like me can use to check out different system designs employed in various instances of waiting lines. It states that over time, the number of customers in a system is equal to their rate of arrival multiplied by the average time they spend in that system. With the Little's Law equation and my own stopwatch, I've proven over and over again that a longer line may actually be a better line. Let me explain. Imagine a situation where you have many shorter lines, each being served by its own cashier. Call it the grocery store model, or the single-server model, more officially. You can get out of there quickly only if you correctly guess which line will move the quickest. And if you're anything like me, you're bound to bet on the wrong line. But a single, longer line, being served by multiple employees – think banking, the motor vehicle department or airport security – is actually faster for everyone, even though it looks much longer than what you're used to seeing in other systems. The main reason is that if there's a price check, a return or some other very slow customer, that delay affects only that cashier directly dealing with the situation. The rest of the line continues to move along. The delay at one cashier gets distributed across the entire system in the multiple-server model, instead of completely stalling out just that one line, as in the single-server model we see in the grocery stores. So even if you see a very long line, as long as it's the only option, you should be pleased. You don't have to guess which line to get in. Little's Law means a single long line is the fairest way to get everyone out of there as fast as possible.